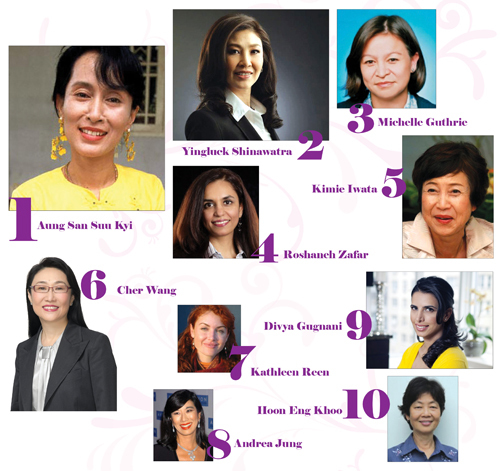 In honor of International Women’s Day, celebrated earlier this month, we introduce our list of 10 women who have contributed immensely to Asian communities all around the world. These women have devoted time and effort and have dedicated their lives for the benefit of society. While Asian women still make up only a small percentage of the global workforce, many have reached incredible heights in all kinds of professional fields, from science to business to politics to social activism. The personal and professional accomplishments of these women have made a great impact on their local, and even global, communities. Hoon Eng Khoo, founder of the website SAFE Singapore, is dedicated to supporting, affirming, and empowering the LGBTQ community. She serves as director of the Office of the Executive Vice President of Academic Affairs at the Yale–National University of Singapore (NUS) College. In 2006, she was honored by NUS with the Excellent Teaching Award. From 2007 to 2010, Khoo was provost and acting vice chancellor with the Asian University for Women (AUW). With 30 years of experience in teaching, researching, and administrative experience at the National University of Malaysia (UKM) and NUS, she has become widely known for her work in biochemistry research and medical education. Divya Gugnani currently serves as the CEO of Behind the Burner, a culinary media brand that provides tips, tricks, and techniques involving food, wine, mixology, and nutrition. She is also the CEO of Send the Trend, a company with the goal of making fashionable but affordable accessories available to women online. She developed her interest in culinary arts while building a career in finance. Gugnani serves on the board of directors for New York Entrepreneur Week, a nonprofit movement on behalf of entrepreneurs who believe they can change the world. In addition, Gugnani was honored as a 2010 Game Changer by The New York Enterprise Report. She will receive an award as one of the Top 50 Outstanding Asian Americans in Business in 2012. Andrea Jung is the current chairperson and CEO of Avon Products. She also serves on the boards of Apple and General Electric. Before joining Avon, Jung was the executive vice president of Neiman Marcus, where she was responsible for accessories, intimate women’s apparel, cosmetics, and children’s wear. In 2008, Jung became the first woman and Asian American to hold a seat on Apple’s board. In addition to simply being a cosmetics company, Avon is called by Jung as “the company for women,” one that helps women start their own businesses selling Avon products. On Dec. 13, 2011, Avon announced that it would induct a new chief executive to separate the roles of chairperson and CEO. Jung will continue being chairperson of the board for at least two more years. Kathleen Reen is the Asia vice president of New Media and Environment Programs for Internews, based in Wash., D.C. As a journalist and country director in Indonesia, Reen has led media and information development programs across the Asian continent and a global Open Internet initiative with a team of 12 international and local partner organizations. In 2006, she was honored as a fellow of the Asia Society’s TV program “Asia 21.” In 2008, she became a fellow of the Flow fund, which supports the development of U.S. domestic and global philanthropy with a focus on social entrepreneurs. The World Economic Forum has selected Reen as a Young Global Leader honoree for 2012. Cher Wang, co-founder and chairwoman of HTC Corporation and VIA Technologies, gained even more success by marketing her father and husband’s companies under HTC, which reported revenues of $9.8 billion in 2010. HTC is the maker of more than one out of every five smartphones. In May 2011, Forbes Magazine ranked her as the richest person in Taiwan, with a net worth of $8.8 billion. In February, Cher Wang announced plans to set up the third Faith Hope chapter. The new foundation will focus on the improvement of educational environments by encouraging new talent and fostering innovation through competitiveness, instead of scholarships or venture capital funds, for the next generation in Taiwan. Kimie Iwata is the vice president of Japanese cosmetics company Shiseido. Her position as a female executive in Japan is rare, and she is a powerful symbol for Japanese women who have made significant progress in the workplace. Iwata helps lead one of the biggest cosmetics companies in the world. She also served in Japan’s Ministry of Health, Labor, and Welfare. In 2010, nearly all women employees in Japan returned to work after childbirth and, more importantly, the number of female managers rose from 12 percent in 2003 to 20 percent in 2010 because of Iwata’s “Kangaroo Staff” program, in which part-time workers fill in for Shiseido’s beauty consultants needing time to care for children. Zafar started with a $10,000 loan from the Grameen Trust, about $92,400 of her own money, and 15 clients. Today, Kashf has more than 306,000 clients. In order to help impoverished women, Kashf has released more than $202 million in small loans. Forbes Magazine listed the Kashf Foundation as one of the world’s top microfinance institutions in 2007, and U.S. President Barack Obama recognized Zafar’s work at the inaugural Presidential Summit on Entrepreneurship. Michelle Guthrie, the Japan and Asia-Pacific (JAPAC) director of Strategic Business Development for Google Asia Pacific, has more than a decade of experience in the media industry across Asia. She is also on the Cable & Satellite Broadcasting Association of Asia (CASBAA) Council of Governors, an organization that shapes the industry’s action regarding a wide range of issues in Asian communities. From 2007 to 2010, Guthrie was based in Hong Kong as a managing director and senior adviser of Providence Equity Partners, the world’s leading private equity firm focused on media, entertainment, communications, and technology. In 2011, Guthrie joined Google as the director of Strategic Business Development for Asia. Yingluck Shinawatra is a successful businesswoman who stepped into her political career as the number one party list candidate for the main opposition Pheu Thai political party. Shinawatra became the current and the first female prime minister in Thailand. With double master’s degrees in political science and business administration, Shinawatra became president of Advanced Info Service (AIS), the largest mobile phone operator in Thailand. In May 2011, the Pheu Thai Party nominated Shinawatra as their candidate for prime minister in the 2011 general election. Shinawatra also manages the finances for the Pheu Thai Party. She campaigned with the political managements mainly on issues of national reconciliation, poverty eradication, and corporate income tax reduction. Aung San Suu Kyi, an advocate for democracy in Burma and a Nobel Peace laureate, symbolizes the struggle of the Burmese people to be free. Suu Kyi has become an international symbol of peaceful resistance against oppression. Suu Kyi helped found the National League for Democracy Burmese political party on Sept. 27, 1988, and is known for her famous speech “Freedom From Fear.” She was put under house arrest by the military junta government on July 20, 1989. After she was released from more than 15 years under house arrest on Nov. 13, 2010, Suu Kyi won the 2011 Wallenberg Medal, awarded to outstanding humanitarians. Abby Sun can be reached at info@nwasianweekly.com. of writing about this post initially?